You have become increasingly fed up with your pathetic social life. You spend your nights wandering up and down the local bar and tavern strip, yet you never actually enter any of these establishments. Eventually, you always end up buying yourself a pint of ice-cream with an absurdly high caloric content and sitting in that creepy park with the satanic-looking memorial statue staring down at you while you eat your "frozen treat" with a plastic spoon and then play frisbee with your dog until one in the morning. So one night you decide to take a stand and go to one of those "wild" parties that your "punk" friend is always bothering you about. After getting lost about four times because of the relentlessly inaccurate directions you received, you eventually stumble upon the relatively normal-looking suburban house where the party is being held. You awake in a bathtub surrounded by cloudy crescents of refrigerator ice. The first thought that enters your numb mind is, 'Lordy! That awful man spiked my drink and made off with my kidneys, which he will promptly sell on the lucrative black market that exists for healthy organs such as my own!' And sure enough, it's pretty obvious by your awful headache that your drink was indeed spiked, but as you reach around and feel your freezing back, there is absolutely no soreness, much less any kidney-removal wounds. You stumble out of the mildew-y bathtub and look at your haggard reflection in the mirror. Then you see it. 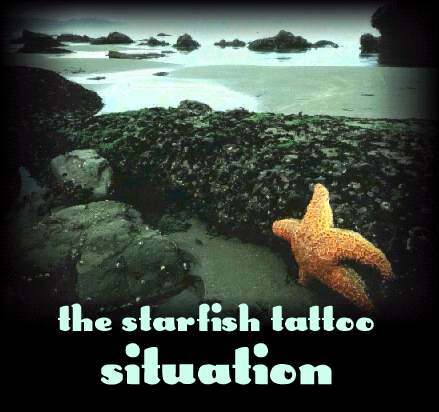 While you were unconscious, somebody tattooed onto your neck a large, grotesque, yellow-orange tattoo of a starfish. It is remarkably unattractive. Not only that, but your parents are VERY conservative and would certainly flip out and disown you if they saw a permanent starfish plastered above your jugular vein. You walk through the deserted party house, hop into your Volvo, and drive home in a rage. The next morning, you go to your job at Long John Silver's (or equivalent seafood restaurant), trying your best to cover up the tattoo with your turtleneck shirt. Unfortunately, this does not work very well, as the starfish is much too large to cover completely. While at your job, your manager notices a starfish arm peeking out over your collar. You hurry to explain, but much to your surprise, he ecstatically cries out, 'This is wonderful!' You look very confused until he explains that having a nautically- or oceanically- themed employee would be excellent for business. He offers you a fiendishly high raise to 67 dollars/hr.